When Buffy the Vampire Slayer ended in 2003 after seven seasons on TV many fans still hadn't had their fill. In response to this a comic series was launched which follows on from the events of the show. The comic is very faithful to the style and tone of the show complete with witty banter, drama and moments of horror, and the characters look just like the actors. 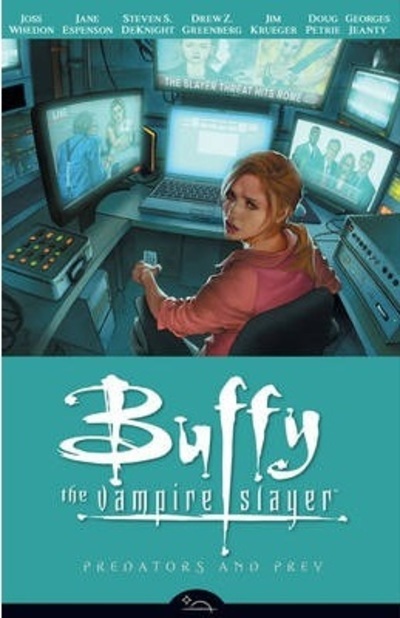 Instead of just one Chosen One, or two as there were for most of the tv show, there is now a whole legion of slayers at Buffy's command, ready to fight evil. There is also now a splinter group lead by a rogue slayer, who start to cause some real trouble in this volume. The series plays with the moral issues that come up when you have a group of people suddenly given a great deal of power who believe that they can justify comitting crimes because they are the "good guys." Predators and Prey, the fifth volume of the series opens with the news that Harmony, another former Sunnydale resident and perpetual teenage vampire, now has her own reality show on MTV. The show's popularity damages the image of the slayers who then go into hiding before being drawn out by the rogue slayers taking over an entire village in Italy. Meanwhile Dawn is still dealing with the aftermath of her failed relationship with a fairy creature called a Thricewise. Having already been transformed first into a giantess and then a centaur, she now becomes a creepy little animate porcelein doll. The creepy is probably redundant there since all porcelein dolls are creepy. But hey, at least she's not a horned fire snail. Faith and Giles travel to Germany to investigate rumours of a sanctuary for slayers who decide to opt out of the ongoing supernatural war. Unsurprisingly, all is not as it seems. Predators and Prey copped a bit of flack for the silliness and lack of substance to the plot but personally I found it a lot of fun. I liked the silliness of the Vampy Cat storyline and Andrew and Buffy "geek bonding" while on a road trip. The Harmony reality show story came at a time when fans the world over were going nuts over Twilight and vampires in general and I found it pretty amusing too. I also liked seeing Kennedy helping Satsu deal with the emotional fallout of kissing Buffy in the previous volume (which is why I have tagged this book "lesbian" although Satsu's sexuality is not a major plot point in volume 5). The writers understand that relationships are sometimes messy and complicated, though they don't usually involve actual monsters. All in all I found Predators and Prey an enjoyable romp and I look forward to Volume 6: Retreat.